Soccer Shots LLC found this article on how kids benefit from time with extended family. Grandparents, aunts, uncles, and older cousins all seem to love spending time with their younger relatives and the children benefit in many ways from getting together with extended family members. Without the stress of direct parenting duties, there's room for exploration and increase in self-esteem and confidence. 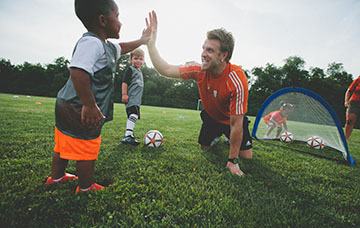 Gains in confidence and self-esteem are two of the benefits that kids get with soccer too. Time that kids spend with mentor, coaches, and teachers has proven to be very valuable to a child's development. Here's the full article on spending time with extended family at WorkingMother.com.